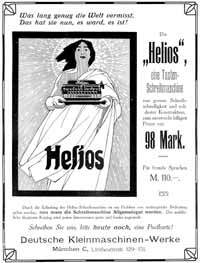 The Helios is an odd little machine with a two row keyboard with only 20 keys to produce a full character set of 80 characters. Three different shift keys on the left side of the keyboard opened the way to all these characters. The Helios was first introduced in 1908 by Justin Bamberger in Munich. 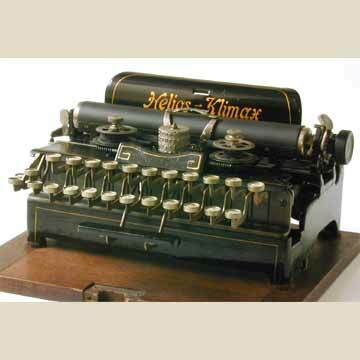 In 1909 production was taken up by the Kanzler typewriter factory in Berlin, that set up the Helios company for this machine. When both Kanzler and Helios dissolved, production was resumed by the Ney company in 1914. Ney introduced the Helios Klimax as it is presented on this page. The detailed picture 6 shows that the typewheel on this machine had four rows of characters. The detail of the keyboard here shows that some keys were used to print two different letters in upper and lower case. When a key was pressed, the typewheel would turn to the right position and hit forward to print the letter onto the paper. The Helios Klimax was also sold at the Ultima to buyers who would pay the machine in monthly installments. The machine is also known as the Bamberger and Portable Extra. Ernst Martin's typewriter history shows a picture of a 3-row Helios, that apparently was never built.